We have an excellent manufacturing unit, which is fitted with comprehensive machines that are specifically imported from USA country. Our cutting edge technology, requisite facility and diligent professionals have enabled us to design our range as per the latest market trends. Apart from this, we carry out stringent quality checks for every lot to maintain total quality in our product range. Our products are tested by our team of quality controllers to guarantee defect free products. We are headed by our owner of the company Mr. AK Gupta, whose sharp business sense and in-depth knowledge has enabled us to establish a strong foothold in the international market. Owing to our high quality standard products and timely delivery of consignment, we have formed a huge clientele across the globe. 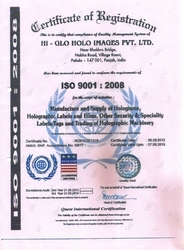 Manufacturing and Trading of of 3D Holograms and Holographic Products. We are expert in offering a durable range such as; 3D Hologram, Hologram Seals/Wads/Strips, Sleeve Labels, Sticker Holograms, Over Printed Hologram, Holo Shrink, Scratch Cards/ Gift Coupons, Hologram Labels and Hologram Films/Foils which is extensively used in different industries. We make of superior quality of holographic films and chemicals as raw material in manufacturing our products. All our raw material is procured from reliable and trusted vendors who are selectively chosen for their credibility and quality standards. The gamut is designed with the help of our designers and professionals who are well versed with the business process and thus enable us to keep pace with the latest trend of the market. Questions, enquiries or complaints are attended to immediately at the highest levels, in the company, personally by the directors if required. • Member of IOC Global. We are perhaps the only company in the world that has a person, who retired as a senior Defense Forces and who has vast experience in the filed of Security and intelligence during his service carrier, as its Managing Director. The choice of location at Patiala, away from any of the Metros, Locale of the Plant at Patiala (Well away & secluded from the hustle and bustle and surrounded by agricultural land belonging to some of the Company directors), Factory, Office building design & procedure adopted at our works etc. Themselves prove the point. At our works not only are the physical security measures adopted but Psychological security measures are also used to ensure absolute guaranty of non-leakage of the Holograms of any client from our end. (No employee with whatever experience can ensure same level of security). We maintain a cordial relationship with our numerous clients based globally. Owing to the quality standards, the gamut such as; Hologram, Seals, Wads, Strips is repeated in demands amongst our clients. Also, in our company we maintain strict quality norms and high standards at each stage of the production procedure. Transparent dealings and special packaging facilities are some of the key factors that enable us to become the foremost priority amongst our global clients. Easy modes of payments, reliable products and use of most advanced technology are some of the prime factors that enable us to win accolades from our numerous clients. We have purchased and maintained (in full running condition at all times) one additional machine of each type in all critical processes as a spare to ensure that we can render timely and uninterrupted supplies for all our clients. All the directors and the GM works have obtained complete training including stripping & repairs on each and every machine in the plant towards the same purpose. We are one of the pioneers in this hi-tech field of authenticity. We have set up an automatic plant with machines imported from the USA at Patiala. We are a team of well experienced & devoted holographers, scientists, technicians and other staff to cater to you need in the real sense. Our directorial staff is highly professional and trained holographers. Equally competent persons have been selected and trained in their respective fields.